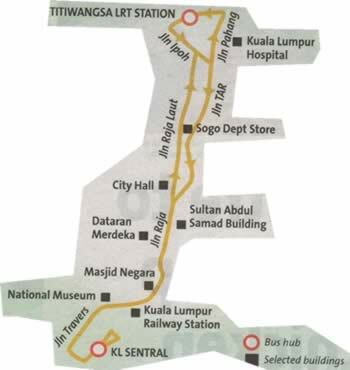 The R109 shuttle service starts at KL shuttle hub, located between Jalan Bangsar and Jalan Tun Sambathan, and ends at the Titiwangsa hub. 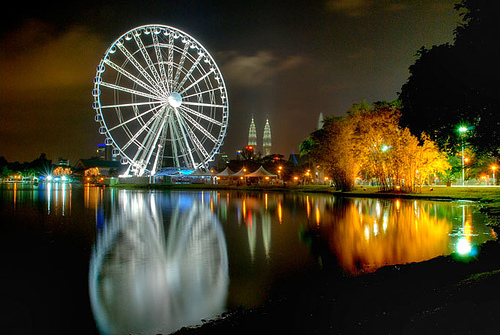 It passes through places like Telekom, Tun Sambanthan Monorial station, National Muzium, National Mosque, Syariah Court, Dayabumi, Dataran Merdeka, KWSP, The Grand Seasons Hotel, Kuala Lumpur Hospital, Titiwangsa Monorail and Maju Junction. Rapid KL's City Shuttle service plies the Titiwangsa, Maluri, KLCC, Medan Pasar and KL Sentral hubs in Kuala Lumpur. The journey from these hubs to the 15 city shuttle routes takes only a maximum 30 minutes so long as the traffic situation is resonable.